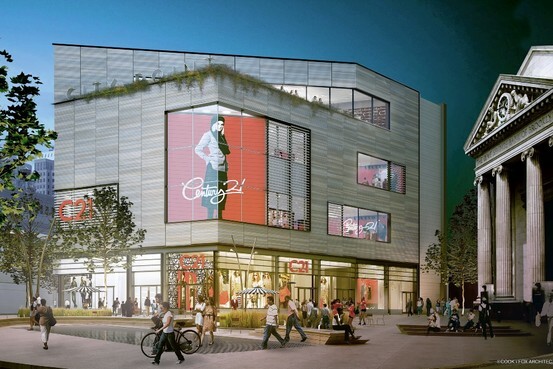 A rendering of Century 21’s proposed City Point store in Brooklyn. 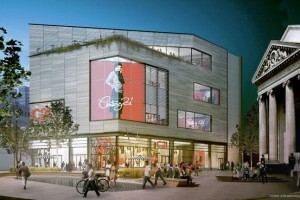 The transformation of Fulton Mall from a Downtown Brooklyn den of cheap cellphone outlets and fast-food joints into a more upscale shopping hub is set to take a significant step forward Thursday with a deal to open a Century 21 Department Store. The popular discount retailer would provide a high-profile anchor for the City Point development, a mix of mostly retail and apartments that is one of the largest projects under way in Brooklyn. It would be the first new traditional department store to open in Downtown Brooklyn since the area slid into decline in the 1970s. By landing Century 21, developers said they would be able to break ground this summer on the bulk of the City Point development—675,000 square feet of retail and commercial space and 690 new market-rate and “affordable” apartment units at Dekalb and Flatbush avenues. The deal—set to be announced on Thursday—could also potentially accelerate the timeline on a later phase of the development, a 680-foot-tall residential tower that would be the tallest building in Brooklyn. The developers, Washington Square Partners and Acadia Realty Trust, plan to break ground on the tower by 2017. “We would not have moved forward without an anchor. Century 21 was what we really needed to make this project a reality,” said Paul Travis, project executive and president of Washington Square Partners. Century 21 said it would open the new 125,000-square-foot store—twice the size of its Upper West Side location—in the fall of 2015. The chain already has deep roots in the borough given that its second location opened half-a-century ago in Bay Ridge. Members of the Gindi family, which owns the chain, still live in the borough. “Downtown Brooklyn is a natural fit for the Century 21 brand, and we are thrilled to be a part of the newly appointed epicenter of fashion, culture and art,” the department store’s chief executive Raymond Gindi said through a spokeswoman. City Point would join other glossy new projects moving forward in Downtown Brooklyn, including the Atlantic Yards project and a new applied-science school planned by New York University. The project is part of a government and private business effort to turn the Fulton Mall into another Brooklyn gentrification story. Developers want to return it to its glory days in the 1920s to 1940s when it was a department-store mecca and rivaled Herald Square. Though it has remained one of the city’s busiest retail strips and already has a Macy’s department store, it has long been dominated by cheap clothing stores. As Downtown Brooklyn and its surrounding neighborhoods have attracted more affluent residents, the city’s Economic Development Corp. and the Downtown Brooklyn Partnership, a local development corporation, have spent some $15 million cleaning the area up, improving landscaping, installing new street lighting and some additional public spaces. In recent months, prominent retailers, including Gap, Aldo, H&M and Shake Shack have opened or signed deals on the Fulton Mall. But the so-called revitalization of the Fulton Mall hasn’t been without controversy, as some have feared an influx of more high-end retailers that could make the street inaccessible to its traditional clientele. The arrival of Century 21, which features high-end designer brands, but at reduced prices, could help strike a compromise. Mr. Travis said the rapid redevelopment of Downtown Brooklyn helped move forward City Point, a city-owned site that developers said is the first new commercial development in more than 30 years on the Fulton Mall. The first, modest 50,000-square-foot tip of the project began in 2010 thanks to a $20 million bond from the federal government’s stimulus program. The developers had planned to break ground this summer on 300,000 square feet of retail and about 250 units of market-rate and affordable housing. Instead, they now plan to announce Thursday more than twice that much retail and residential development. BFC Partners will build one building with 250 apartment units, half of which will be below market-rate and financed by the New York City Housing Development Corp. The second building is being developed by the Brodsky Organization and Michael Field, with 440 market-rate apartments.